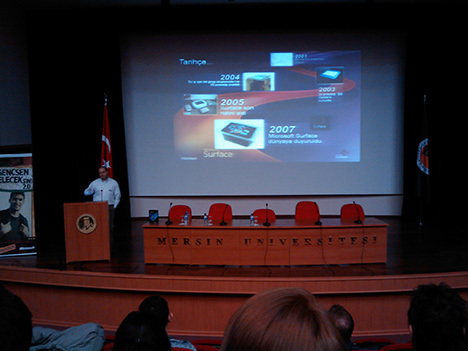 Technology tour organized by Turkcell (Turkey’s prominent cell phone operator) and Microsoft was here in Mersin today, where both Turkcell and Microsoft’s representatives try to tell about their future perspectives to the students. Turkcell’s Gökhan Yıldırım, who is talking about “technology” and still using “Internet Explorer 6” on his notebook, talked about 3G and the technologies they are thinking to build around it, such as media streaming, integration with home and car automation systems, mobile internet etc. I know, if you’re visiting this blog from Europe or U.S., you are probably thinking “what is so new about it?”. You are so right, nothing new about this for the rest of the world. Because there were some disagreements between Turkcell and other operators about whether transferring numbers between different operators should allowed or not, licensing process of 3G delayed more than a year and has not been accomplished until last December. Although every operator got a license now, we are still lacking a 3G signal and, according to Mr. Yıldırım, we have to wait till the calendars show June. 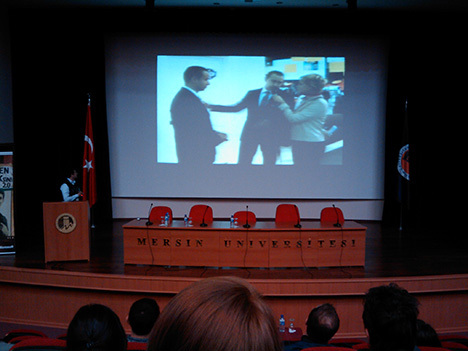 Microsoft’s Mehmet Tunçkanat has given us a little more interesting speech. He talked about cloud computing, Live Mesh, Azure, Surface, Silverlight, IE8 etc. Interesting thing is, although he talked about mobile technologies and they were about give a free PDA to the one of the attendees, he never mentioned the Windows Mobile’s last year achievement, and its’ upcoming version v6.5. Also, while everybody else in the world is talking about it, he hasn’t said a word about Windows 7. At the end, I liked the idea of touring with tech industry professionals talking about future with students. But, being limited to two companies, especially not seeing anybody talking about web development and technologies was a disappointment.